Our Castile and Black Soaps are safe and effective for hundreds of household uses, but specially formulated for gentle, natural skin care. 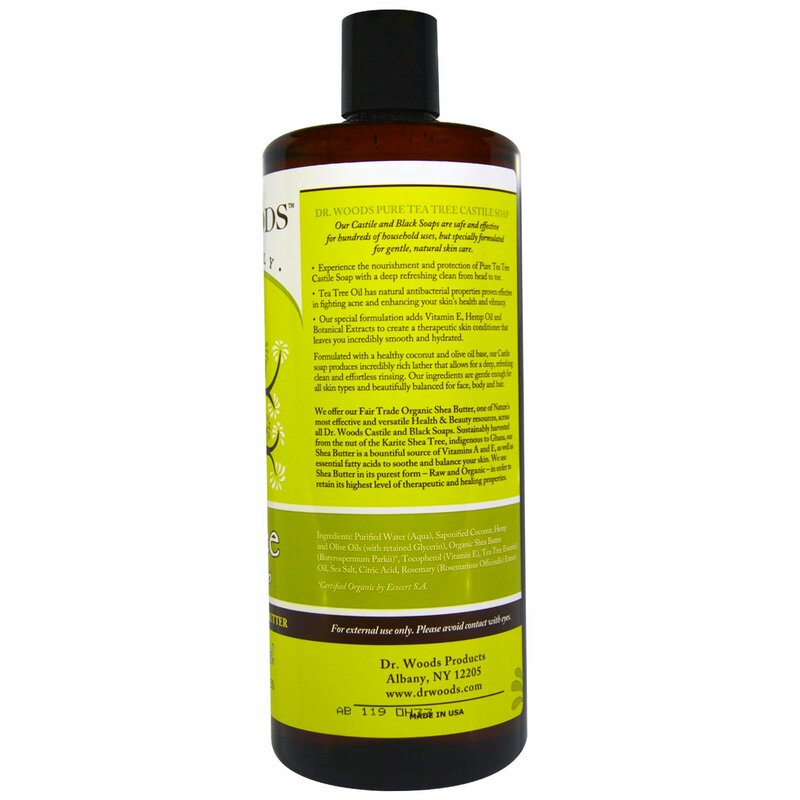 Experience the nourishment and protection of Pure Tea Tree Castile Soap with a deep refreshing clean from head to toe. Tea Tree Oil has natural antibacterial properties proven effective in fighting acne and enhancing your skin's health and vibrancy. Our special formulation adds Vitamin E, Hemp Oil, and Botanical Extracts to create a therapeutic skin conditioner that leaves you incredibly smooth and hydrated. Formulated with a healthy coconut and olive oil base, our Castile soap produces incredibly rich lather that allows for a deep, refreshing clean and effortless rinsing. Our ingredients are gentle enough for all skin types and beautifully balanced for face, body and hair. We offer our Fair Trade Organic Shea Butter, one of Nature's most effective and versatile Health & Beauty resources, across all Dr.Woods Castile and Black Soaps. Sustainably harvested from the nut of the Karite Shea Tree, indigenous to Ghana, our Shea Butter is a bountiful source of Vitamin A and E, as well as essential fatty acids to soothe and balance your skin. We use Shea Butter in its purest form-Raw and Organic- in order to retain in highest level of therapeutic and healing properties. Dr. Woods is a family business born from our own passionate quest to produce the finest and most effective Health & Beauty products in the world. Our family is wonderfully diverse with different ages, skin types, hair textures and styling needs, so creating truly healthy, highly effective products that work for all of us was an inspiring challenge...and with diligence, creativity and lots of love, we created the most beneficial and environmentally sustainable products available. 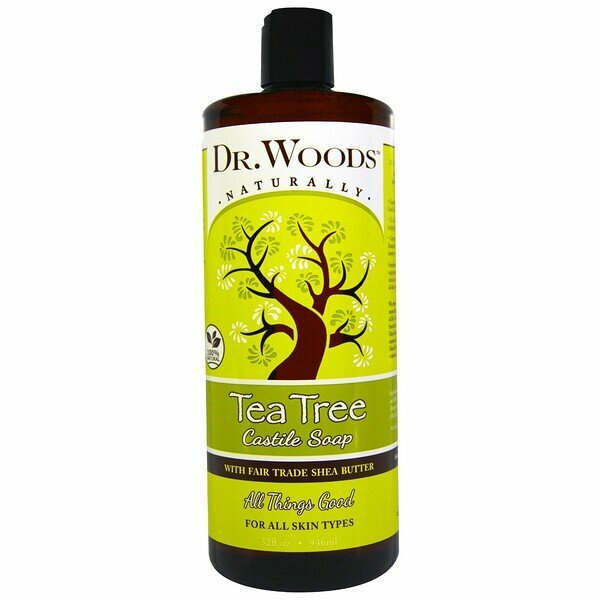 Dr. Woods draws on the very best time-tested healing traditions together with modern formulation processes. We choose to keep our products as natural as possible, without compromising effectiveness, using the best pure ingredients from around the world and never containing dangerous chemical additives or harsh detergents that strip away your skin's natural elasticity. We've also worked incredibly hard to make our products truly affordable so good health and exceptional quality are accessible to everyone. Purified water (aqua), saponified coconut, hemp and olive oils (with retained glycerin), organic shea butter (butyrospermum parkii)*, tocopherol (vitamin E), tea tree essential oil, sea salt, citric acid, rosemary (rosemarinus officinalis) extract.